Another great Working Women Wednesdays on That Business Show with Jamie Meloni as I got to speak with two very accomplished professional women on the show today. The show led off with the Founder/CEO of Working Women of Tampa Bay Jessica Rivelli talking about the organization and promoting Women’s History Month which is going this month. Jessica’s group is a highly influential and networked group in the Tampa region and you can learn more about this amazing group at http://www.workingwomenoftampabay.com. The 2nd guest on the show was Patricia Rossi, business etiquette coach and author of Everyday Etiquette. Patricia is the host of NBC Daytime’s weekly Manners Minute which airs in 165 markets and is Twitter’s #1 Etiquette professional worldwide. She spoke of how to make a lasting first impression which includes first remembering the person’s name. A great tip for this is to always say the person’s name back to them when you meet them. She spoke of how to ask your boss for a raise and also shared the etiquette behind hand shaking. Making a lasting first impression is important in the business world and Patricia Rossi is the go to coach and expert for assistance in this field. 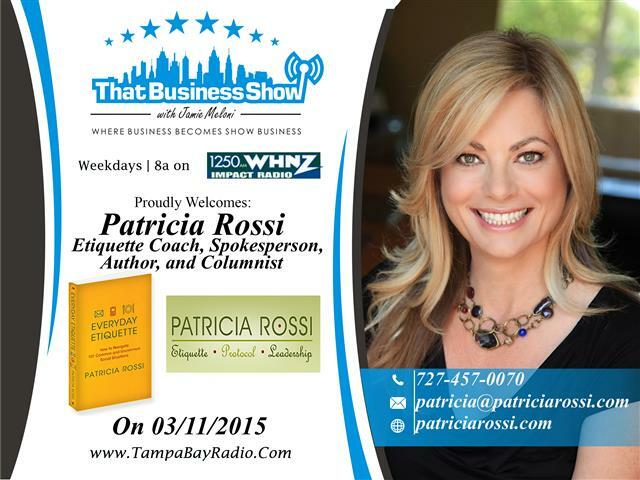 Learn more about business etiquette and Patricia at her website http://www.patriciarossi.com or contact her directly at 727-457-0070 or email at patricia@patriciarossi.com. 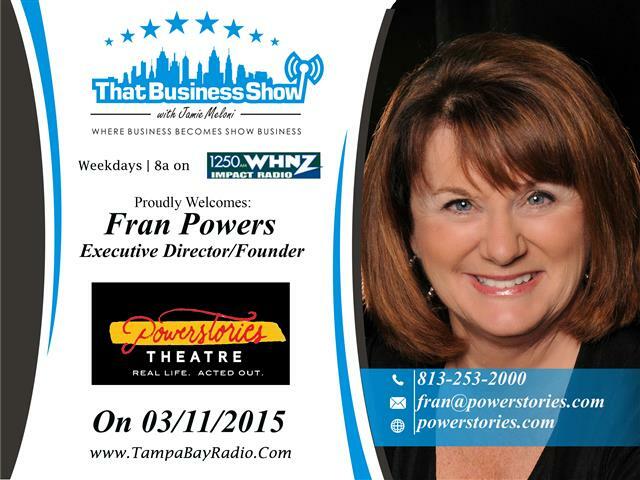 On the 2nd half of the show, I spoke with Fran Powers of PowerStories, a theatrical production company performing true stories on stage. Through powerful storytelling and acting, these true stories of today’s social issues connect with audiences on a very personal level. And when that happens, AUDIENCES feel inspired and empowered to strengthen their own lives. Fran spoke of her inspirational moment riding a bike across America and crossing the Wyoming border as her awe inspiring moment that led to this fascinating business model. PowerStories has programs and events designed to assist and help women from the inner City find their ways in life and also serves as a forum for people that need help with public speaking or even stand up comedy. In 2010, PowerStories Theatre won The National Arts and Humanities Youth Program Award which is the highest award in the nation presented by the Federal Government. It was presented to Fran at the White House by First Lady Michelle Obama. In 2011 PowerStories won the WEDU award for Artistic Excellence and in 2013, Fran was honored as a Community Hero by the Tampa Bay Lightning. Learn more about Fran and how you can get involved at http://www.powerstories.com or directly at 813-253-2000 or email at fran@powerstories.com!